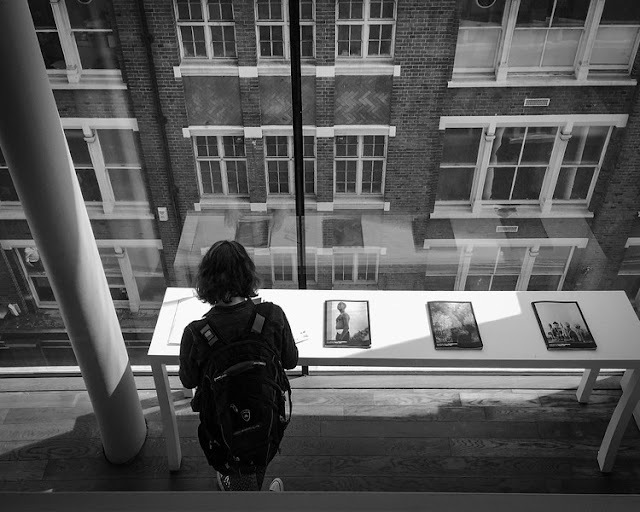 There are two things in life that draw me into a region of space-time where the idea of time passing has no real meaning: bookstores (new and used) and art galleries. I had such an experience while in London a while back. The good lady wife was knee deep in horticulture at the Chelsea Flower Show so I hoofed it down the embankment waving at the Battersea Power Station, MI6, on along to Westminster and then over Blackfriars to the Tate Modern. I was tempted to stop at the Tate Britain as they had a Hockney retrospective but as much as I like Hockney, the Modern was my goal. The spaces there are amazing. 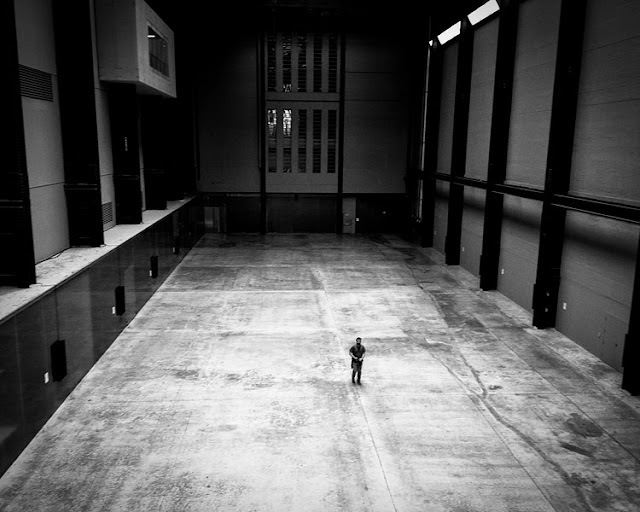 The Turbine Hall is a massive space and currently (hah) devoted to a sound installation where as you walk through the hall you are hit by different sound loops. The effect is not dissimilar from "On the Run" from Dark Side of the Moon. 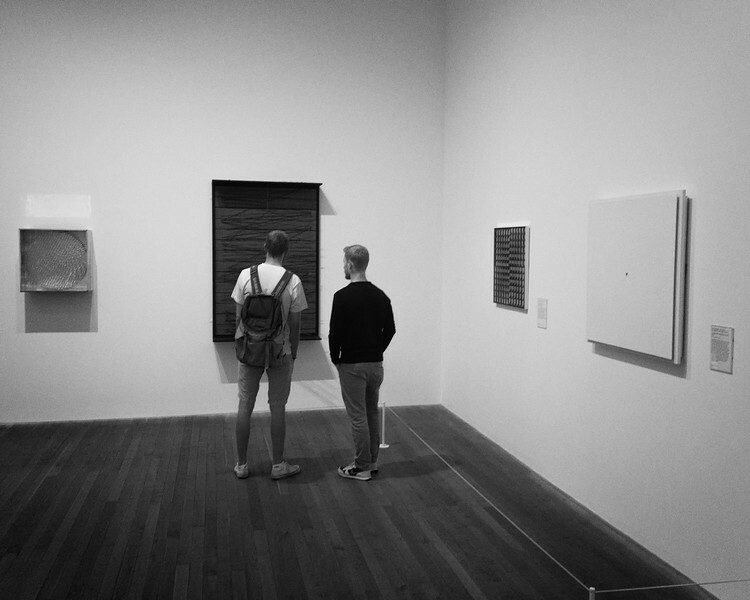 The Tate Modern is a wondrous place. Even when busy, it has the size to allow you to retreat. Time stood still for me as I wandered the halls. Oh the ideas, the dangerous disruptive ideas churning away in there. As I wandered I was struck by the number of people walking at a seemingly brisk pace, raising a camera or smartphone, click and on to harvest the next image. I had started make some images but for some reason I stopped; perhaps the artwork was too captivating. Along the way I had an "AHA" moment. 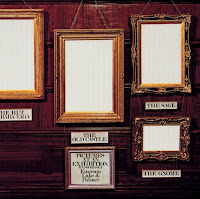 A project presented itself: "Pictures at an Exhibition". I became interested in the question: "How do people interact with the gallery and the artwork?" In bygone times you would sit, sketchbook and pencil in hand, and "commune" with the artwork: drinking it in, responding to what Walter Benjamin would refer to as the "aura". You would write down what you felt, make some sketches, trying to understand the technique, trying to read what the artist is trying to tell you, trying to answer questions and seek clarification through contemplation. I did see some of that, two men in close, hushed conversation as they tried to work through what was being shown, but unfortunately many where like a botanist from the Age of Exploration, pithing butterflies on blotters and pressing flowers in books. 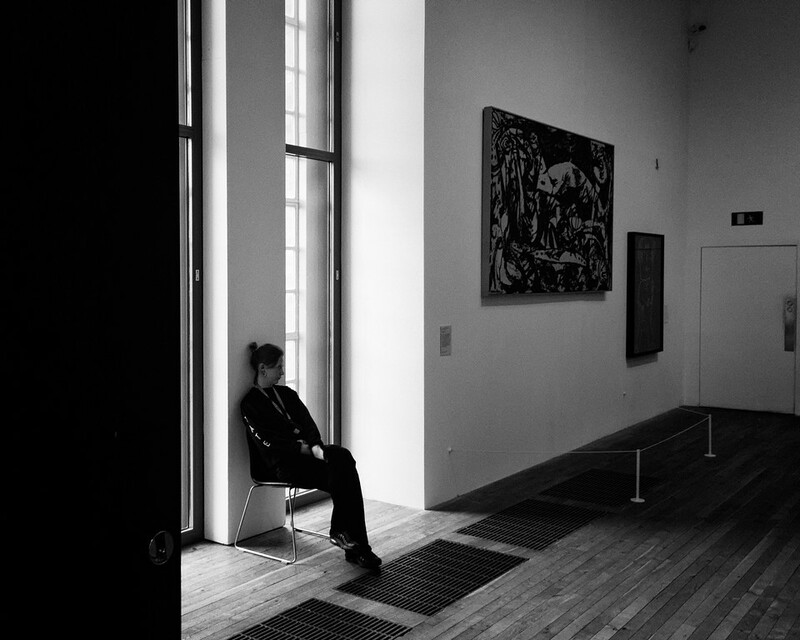 Maybe I'm not in tune, may that's the way of the world now: capturing mementos of things seen in museums for later study (possibly), but heavens, the Tate has most of this available on line now: better exposed and annotated. Am I trying to obfuscate what a gallery is for? Is in fact the taking of pictures the latest in the democratization of art? Berger writes that once art could be reproduced it was democratized, making it available to all, taking it out of the hands of the moneyed classes and making it available to everyone. Am I trying to block that democratization? Once art has been liberated from the artistic power structures, Berger writes, they try to stuff the genie back into the bottle by surrounding it with complex terminology and controlling access: restricting how close you can come to the artwork and "curating" (controlling access) artists' work. Interestingly, the Tate Modern is complicit in this in some regard. I was at the oddly named Louisiana Museum of Modern Art in Humlebaek, Denmark just prior. Both galleries had Giacometti. Louisiana encouraged you to interact with the sculpture; the Tate had little white strings around everything and if you got too close an exceedingly bored docent shooed you along. I realize that London isn't a quiet little village outside of Copenhagen and that the two societies are different, but it is interesting. Oddly enough, none of the Danes even thought to touch the Giacometti; it just wasn't done. 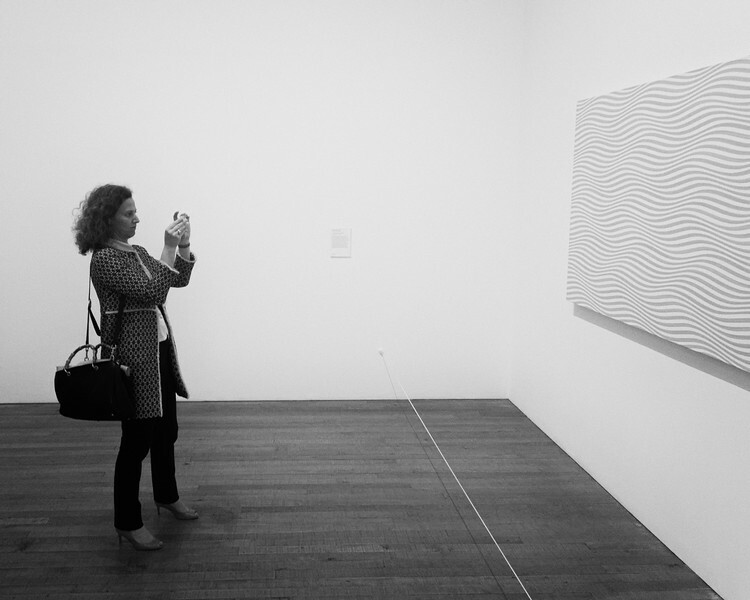 The last picture in the sequence is not from the Tate Modern, but The Photographers' Gallery. This is an intimate gallery in London and well worth seeking out. When I was there they had the three finalists for the 2017 the Deutsche Börse Photography Foundation Prize and a remounting of Roger Mayne's installation "The British at Leisure". These images where all made with my iPhone 6s using the 645 Pro Mk III app. This app shoots Raw (dng) and allows you to save a .tif image using the emulsion of your choice along side the RAW file. It's my go-to photo app and truth be told, it's what's keeping me on the iThingy. I haven't found a suitable Android equivalent yet.